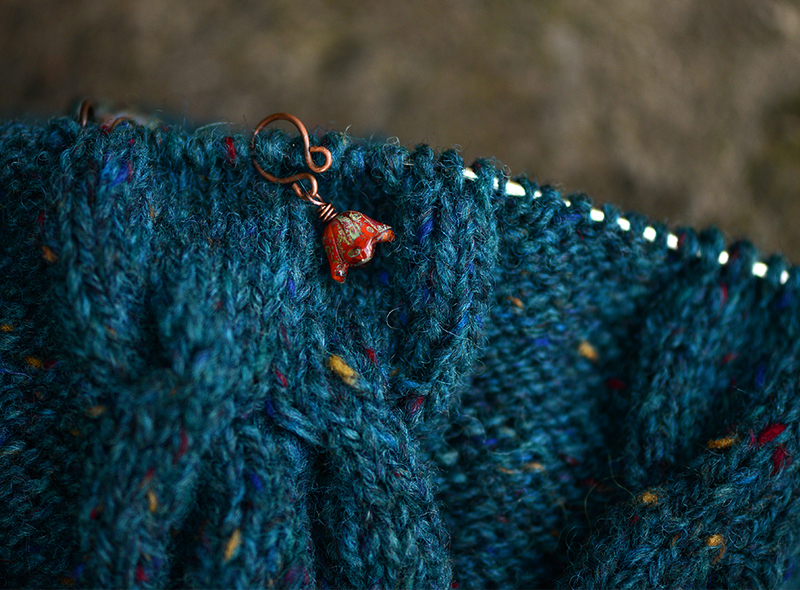 I wanted to design my own stitch markers pretty much as soon as I began using them. The standard safetypin style markers did the job just fine, but I always found them lacking in ...presence, for want of a better word! My fingers, as well as my eyes, wanted something a bit more substantial, more engaging. But not bulky! Or weighty. Or overly dangly, or cluttered. As much choice as there was out there for stitch markers, store-bought and handmade, none were quite what I had in mind. Then two things happened, in close succession: Fist, I fell in love with Bohemian glass beads. After using some as buttons on a cardigan last year, I pretty much wanted Bohemian-glass everything (see them also on my first tweed jacket attempt). The tiny beads are smooth and warm to the touch; they are intricately formed, and the colours are simply gorgeous. It occurred to me they could make ideal stitch markers. I even contemplated making some myself. Luckily, instead I met a fabulous jewelry maker - Suzie, of What Suzie Made Next - who is also a fledgling knitter. I shared my stitch marker dreams with her, and she was game to turn them into reality. Our first course of action was to experiment with hardware. My main criterion was, that the markers be removable. However, I did not like the idea of clasps or closures. There is an awkwardness to them, as well as the potential to catch. An evening of knitting with some prototypes confirmed this. It also confirmed that I did not want anything long or dangly. One bead felt just right sliding between my fingers and resting against the yarn. Multiple beads felt distracting and draggy, and introduced additional potential for catching. We then experimented with several single-bead, removable, clasp-free designs, which all worked fairly well - but some better than others. On the finalised design, we got the balance just right, and ensured that yarn doesn't catch on any part of the hardware. We also tried beads with different weights and shapes. And I kept coming back to the same two: a smaller bell-flower bead seemed to work best with finer yarns, and a larger flat flower bead with bulkier yarns. So in the end, I will probably offer two styles of stitch markers. I have now finalised their hardware designs and have almost finalised the bead choice. Been knitting with the prototypes for a couple of days and I'm in heaven. The weight, the feel are just right. And they are ever so beautiful. Of course stitch marker preferences are such a personal thing. These will not be for everyone. But hopefully the small batch coming soon to the shop will make some folks as happy as these have made me. If you fancy a pre-order, drop me a line. Otherwise stay tuned and I hope to have these up in a couple of weeks.